Orlestone Oak's hardwood decking is suitable for all decking projects whether at ground level for patios and walkways, or for balconies and platforms at an elevated level. Your deck can become an extension to your home, an additional garden area, or a combination of both. 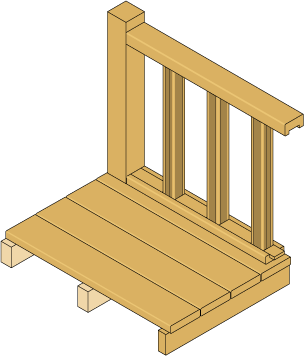 We stock oak decking and yellow balau decking ready for despatch, but can supply other hardwood and softwood decking such as Douglas Fir and Larch. 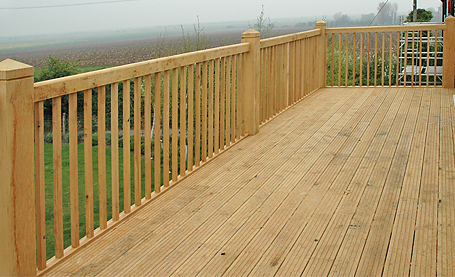 We can also supply longer lengths, thicker widths and wider decking boards on request. Please contact us with any requests regarding longer lengths, thicker and wider decking boards, or other softwood and hardwood decking. 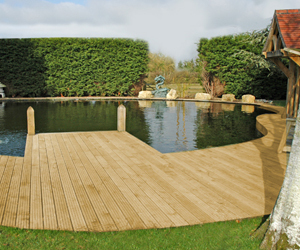 A solid oak decking platform constructed over a large garden pond. 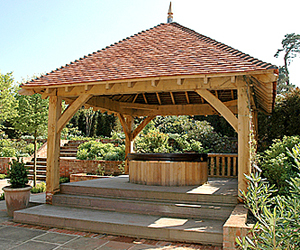 Decking used as a floor to this Orlestone Oak gazebo built as a hot-tub shade. Oak decking was used for the floor of this unusully shaped balcony. 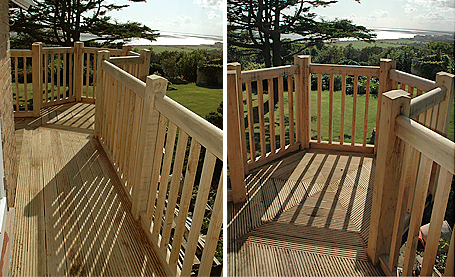 Handrails and baulastrades are an ideal way to complete a raised platform or decking project.